“You’ve reached Neopia’s 411. How can I help you? No... this isn’t a ‘phone’! No, there’s somebody in here... look, I think you need more help than I can provide.” Click. “... Excuse me?” Someone rapped on the outside of the tiny, metallic cylinder. Then they pressed their face up to Sarah’s window. Sarah grinned sheepishly. “Have a nice day.” She began to close the window. The Chia shoved his hand into the empty space and refused to let it shut. “Well, you don’t seem like the most polite person to do the job in the first place...” The Chia opened the door to the Help Booth, waiting for Sarah to hop out. “If it’s a matter of her attitude, sir – I could always take over.” Samuel smiled his best smile and scooted towards the window. “And that’s exactly the problem.” The Chia shoved the door open, and began to lead Sarah out. Her voice trailed off into the air as the Chia disappeared in the distance. Sarah slumped into the grass. Her booth had been located on the edge of Neopia Central for as long as she could remember. She had been drawn into Neopia just for this purpose – just to run the booth. But now... now it was gone. It’d sit there for years, a relic to the old Neopia – but a disorganized, cluttered relic to be mocked. Her voice came out a pitiful squeak. A voice about equal to Sam’s ‘I’m terrified’ voice. Suddenly, Sarah regretted being rude to Samuel all those years. “Well... now what?” Sarah turned to Samuel. Sarah looked around with a terrified expression. “I NEED TO FIND AN ITEM.” Sarah blurted it out without a second thought, and then began to regret it. The Shop Wizard turned around and smiled. Bouncing up and down in all of his JubJub enthusiasm, he politely responded, “I can help you find any item in the Neopian shops... unless you reallyreallyreallyreally need to find that item and you’re running out of time and I feel like banning you.” He grinned mischievously, a tale of a million shop-pricers’ and questers’ failures lurking behind his eyes. “Ehh, I’m not going to even ask if you want me to put a maximum or minimum price on this search. Nobody ever does.” He laughed to himself and then insanely began screaming out bizarre words and phrases as he began to glow and sparkle in a million different colors. “Shhh! Don’t interrupt the spell!” Samuel succeeded in keeping a straight face, but then burst out laughing. “NO!” Sarah launched herself at the Shop Wizard, begging him not to continue. “I KNOW EVERY ITEM IN NEOPIA. I could have told you that ‘Job’ was not an item, dimwit!” Sarah stomped one foot deep into the ground as she clenched her fist. “I would like a job. This is, after all, the Faerieland Employment Agency... right?” Sarah grinned hopefully at the secretary behind the desk. “Oh, thank you!” Sarah skipped over to the door and pulled it open. Hundreds of pets sat in one tiny room, all cramped around ten or so small windows. A large clock ticked overhead, and every single one of them stared at the clock with huge red eyes. With every tick of the clock, they all jerked slightly in unison. Finally, something to break the monotonous ticking! Sarah’s heart leapt with hope. However, then Sarah saw who the speaker was. A young blue Techo screamed and ran across the room, practically foaming at the mouth. “Shut up, idiot! It’s not for another two minutes!” a dirt covered Skeith snarled at the Techo as he ran past. With wide eyes, Sarah quietly closed the door. She turned back towards the desk, and quietly shuffled over to the secretary. Sarah was speechless. She just nodded. “I was just at the Shop Wizard, and he was totally rude, so if I can avoid buying a coupon...” Sarah’s eyes looked hopeful. “I can’t help you. Sorry.” The secretary Lenny turned around in her chair and began to file something into the cabinet behind her. “Don’t you know who I am? !” Sarah begged and pleaded. Sarah shook her head, and then began to walk away. A tiny bell jingled as Sarah entered the shop. Potion after potion lined the walls. Sarah’s books led her to recognize every single one of them, and she excitedly trembled at finally getting to see all of them in person. Some shimmered in the light, sparkling brilliantly of every color. Yet, at the same time, many seemed to eat the life right out of the air, darkening their corner of the shop. Some floated and hovered in their jars. Some potions hardly even seemed to be there at all, nothing more than wisps of air. Some, when Sarah put her hand closer, warmed her. And others felt rather cold. Sarah turned around. A bright red Zafara stood in front of her. She was wearing a starry wizards’ hat and a brilliant navy blue cloak, each step causing her clothes to billow in the wind. Kayla lifted an eyebrow. “Yes... and this is my shop. Right in the middle of Meridell’s castle. Which is why it said ‘Kayla's Potion Shop’ on the sign.” Despite her words, however, Kayla grinned slightly at the fangirling Sarah. “Well... my name is Sarah, and I used to help Neopians find the answers to their question-” Sarah began, but she was abruptly cut off. “Are you saying that you don’t want me working here?” Sarah sighed and got ready to leave. Sarah walked slowly out of the shop, her head lowered in defeat. “Best of luck to you. Stop by if you ever need any potions.” Kayla’s voice rang out sweetly, but it was not enough to encourage Sarah. Sarah hadn’t said a word the whole trip home. It was beginning to get dark. Tomorrow was the start of a new reality – a reality that seemed to be jobless. With every step, her feet dragged along the floor. She could hardly force herself to budge, let alone stroll with intelligence and charisma. Sam was inching along beside her, his usual exuberant self, but even he seemed to be concerned. As the sky got darker and darker, so did Sarah’s spirits. They walked past a small, tattered booth. Signs stuck out from every angle, each screaming for someone to read them. Sarah stopped and turned around. Letting curiosity get the best of her, she shuffled close enough to read the words. The booth was rather empty. And, as she read all the signs, she quickly figured out what she had to do. “Why, it’s the Weather Predictions Booth! I’ve read about this!” Sarah beamed, and then went behind the sign. “This sign is broken. And I’ve lived in Neopia Central all my life! I could make a prediction about the weather. Let’s see... well, it looks like it’ll be a clear night.” Sarah smiled, and changed the text on the sign. Right then, she felt a drop on her face. She slumped to the ground and buried her face in her paws. An angry Wocky – who looked a lot like one of the deranged Neopets at the Employment Agency – screamed at Sarah as she passed by. Some Kacheek on a bicycle threw something at her, and yet another person ranted about the weather prediction being off. Tears began to form in Sarah’s eyes. Sam inched up close to her, and then curled up on her head. For such a small creature, it was the only comforting thing he could think to do. Sarah’s voice echoed in the darkness as she began to stand up and walk. The rain pounded against her with every step, splashing mud and filth all over her feet. Her blue Zafara fur became caked with mud, and her glasses soon were difficult to see out of. Thunder boomed close by, yet Sarah didn’t flinch. Her eyes were unfocused, staring forward, deep inside of her well-learned thoughts. Sarah looked up. Her old booth sat right in front of her. It saddened her to see it, but she quickly realized that it had a decent enough porch to keep off the rain. With Sam still on her head, she crawled up underneath its tiny porch. “Sarah... we have a house.” Sam looked at the rain. No longer was he enthusiastic. He was tired. He was cold. And he was scared for Sarah. “What?” Sam looked down at her, confused. With that, a shadow emerged from the darkness. It was a child, sopping wet and confused. Her teeth shattered, and her eyes were red with tears. Sarah didn’t know if this child’s owner was ever coming back. She didn’t know if this child had a place to stay, food to eat, or a blanket to keep her warm. But Sarah did know that the little girl had come to the right place. Sarah smiled. As she closed her eyes and began to speak... the rain stopped. Sarah looked at all of the children sitting around the booth, eagerly waiting to hear a story. Although Sarah could never get back into her booth, could never legally call it her own... it had still remained hers. But, this time, it wasn’t about answering random users’ questions. It wasn’t about helping jerks find their way around Neopia, or acting like a know-it-all. Sarah’s booth had become Neopia’s Lost and Found. When a pet got lost, they knew where to come. Their owners also knew where to look. It was Neopia’s safe haven, Neopia’s hiding place for the confused and scared. Sarah truly got to help. As Sarah began to talk in a melodic voice, bringing each story of the Neopedia to life, recalling every Neopian Times story and adventure in existence... her audience listened in wonder. No longer were they afraid to be alone in such a huge, huge world. Because, suddenly, there were others lost like them. Many of the kids were regulars. Sarah had started a story time, whether she had wanted to or not. Now she knew, however, that she was cool with it. The majority of the kids were happy, loved pets – blessed pets who loved to hear a good tale. However, some of the kids didn’t have a home, didn’t have owners who were ever coming back, didn’t have anything more than the Soup Kitchen... Sarah would keep reading and recalling for all of them. When owners would find their pets, safe and unconcerned, they’d graciously pull out their bags of Neopoints. Sarah didn’t need a lot of Neopoints..
To this day, you can still find Sarah in the same exact spot where users once demanded her answers. She’s still recalling stories of the past. She was horribly, horribly, out of touch with the current technology. She was kind of an outcast. All of her information and history stored in her head was far too old to have relevance. Her help page had been far-flung, with ‘General Info’, ‘User Prefs’, and ‘Safety Tips’ right next to each other. What's Wrong With Spooky Petpets? 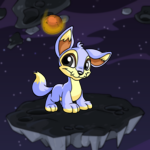 There are so many great Spooky Petpets out there that no one ever seems to notice!